Want a Little Cupcake, Cupcake? 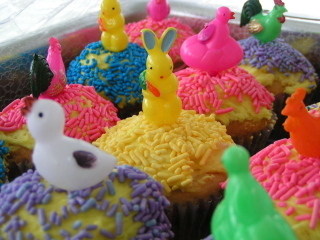 I made cupcakes for Easter! I'm a little new to the cupcake making world but these were delicious. I saw some gorgeous jimmies at our local grocer a few weeks ago and had to have them for Easter. Then at Blumchen, I saw some cupcake picks. Unfortunately, they were out of them so I scooped some up from eBay. Aren't they darling? I found two recipes that looked good from a recent Southern Living magazine and, with a little help from All Recipes and my friend Marsha, I made some yummy cupcakes! The first cupcakes were chocolate cupcakes that I dipped in chocolate ganache and, once cooled, piped in a whipped cream frosting. They are kind of like Ho-Hos. I had a problem that I'm waiting to hear from Marsha on where the filling seeped a little watery fluid. They tasted great but I'd like a stiffer texture. 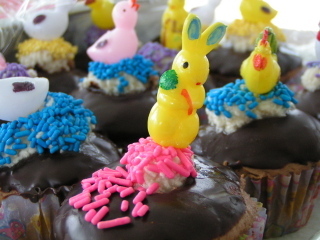 Alternatively, I may make these and fill them just to to the top of the cupcake and then dip in the ganache. The second batch of cupcakes were a tasty white cupcake with a white frosting that I tinted yellow because the vanilla make the frosting a little too dingy for my tastes. I added lemon extract to match the sunny color of the frosting. I recommend both cupcake recipes. I would probably use a cream cheese frosting for the white cupcakes if doing them again. Follow the link for the recipes. 1. Beat first 5 ingredients at low speed with an electric mixer just until dry ingredients are moistened. Increase speed to medium, and beat 3 to 4 minutes or until smooth, stopping to scrape bowl as needed. 3. Bake at 350° for 25 minutes or until a wooden pick inserted in center comes out clean. Cool in pans on wire racks 10 minutes; remove cupcakes from pans to wire racks, and cool 1 hour or until completely cool. Boil cream in a small saucepan. As soon as it starts to boil, pour over chopped chocolate in a bowl. Stir until smooth. Let cool slightly. Whisk together flour, milk and salt in a small saucepan. Cook over low to medium heat until think (whisk constantly so you don't get any lumps). Cool. Beat margarine, shortening, sugar and vanilla until light and fluffy. Add flour mixture and beat again until light and fluffy. Beat slowly at first until incorporated and then at a high speed. A KitchenAid stand mixer with the whisk attachment, if you have one, is recommended. The finished mixture should be smooth on your tongue, not grainy. Stores will in the refrigerator. Put the whipped icing in a cake bag fitted with a large hole tip. Poke the tip in the top of the ganache-iced cupcake and fill and then make a nice little top. Dip the top in jimmies and put a pick in. 1. Beat first 6 ingredients at low speed with an electric mixer just until dry ingredients are moistened. Increase speed to medium, and beat 2 minutes or until batter is smooth, stopping to scrape bowl as needed. 1. Beat butter with an electric mixer at medium-high speed until creamy. Gradually beat in sugar until smooth. Beat in vanilla and 2 T of milk, adding additional milk, if necessary for desired consistency. I added yellow gel food coloring and 1 t of lemon extract. After frosting a cupcake, I would dip the top in jimmies and put a pick in the center. If anyone's interested, they were very yummy!